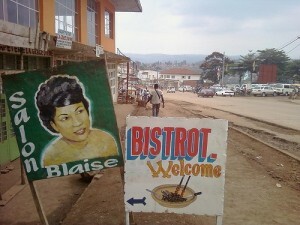 Terroirist: A Daily Wine Blog » Wine Where? 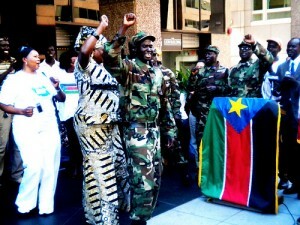 A flag-raising ceremony at the new Embassy of South Sudan. Uploaded to flickr by ENOUGH Project. Welcome back to the Wide World of Wine! This installation will explore the terroir of the newest country on the planet, South Sudan. First, some relevant background information, then we’ll get to the wine. From the introduction of Sharia law in 1983 until the peace accords of 2005, possession of alcohol was a crime punishable by law in Sudan. According to the BBC, perpetrators were usually whipped. The approval of a 2011 referendum separated Sudan into two countries, with a largely Muslim population in the north and a heterogeneous non-Muslim population in the south. I’ve spent most of my holiday break in Odell, Texas, at my family’s hunting lodge, which is backed up against the Red River on the border of Texas & Oklahoma. 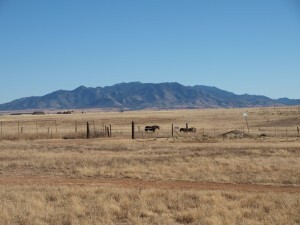 The horizon is expansive and the land is absolutely teeming with deer, turkey, dove, and wild hogs. 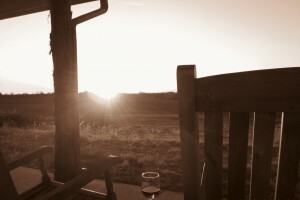 Our tradition each evening is to sink into one of the huge rocking chairs on the back porch, sip wine, and watch the sun set. 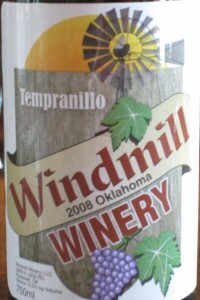 So, when I saw a bottle of Windmill Winery Tempranillo from Roosevelt, Oklahoma (population: 248) , I figured it was worth adding to our relaxing ritual — especially for $7. I did a little research before opening it and learned that Oklahoma boasts ~52 wineries. (Note: This is far fewer than the 200+ in Texas — yet another reason TX is superior to OK). The wine poured out a slightly translucent, bricky garnet color. The nose was dominated by cinnamon, cloves, and dark rich fruits like currants & plum. It reminded me of a Christmas candle. I got hints of leather and dust, but was expecting more based on the Texas Tempranillos I’ve tried. On the palate, I picked up a lot of sour cranberry, which later opened up into extracted berry notes, a transformation I found a little surprising given a) this is tempranillo and b) it’s a restrained 12% alcohol. Also a little mineral and dustiness. Short finish. My expectations were low, and this wine exceeded them. If you see Windmill on the shelves and have $7 in your pocket, it’s definitely worth trying. Over the past six months, I’ve seen a number of my former classmates, including some close friends, take off to live in some very difficult places. Two years ago we were spending our days in the library and our nights drinking cheap wine in the osterie of Bologna. Now, these same people are working for NGOs, government agencies, and international organizations in places like the Democratic Republic of Congo, Afghanistan, and South Sudan. Knowing how much these friends enjoy their wine, I was curious to learn how they were coping with their new surroundings: how do you unwind after a long day’s work in places that have been ravaged by war, civil unrest, and a severe lack of resources? So I sent them each a set of questions to give me a better idea of their new lives and habits. I received some really interesting, unexpected responses. In fact, they were so interesting that we decided to start a new series on Terroirist called “The Wide World of Wine.” Each installation will take us on a virtual tour of a new location through the eyes of an oenophile. Today marks the beginning of September. But it’s also the first annual International Tempranillo Day! Tempranillo is the legendary Spanish grape native to Iberia that’s at the heart of Rioja and Ribera del Duero wines — and is increasingly grown throughout the world. The grape has some 60 regional synonyms; during a trip to Portugal last summer, I fondly recall quaffing quite a bit of Aragonez, the Portuguese equivalent. TAPAS — the Tempranillo Advocates Producers and Amigos Society — sent Terroirist a few bottles of Tempranillo to celebrate the occasion. So we’ll be hosting a tasting this evening, with Spanish meats and cheeses to boot. I’ll be live-tweeting the tasting, so be sure to follow @robbyschrum for up-to-the-minute coverage. We may not break any news — but we may help you pick out a bottle of Tempranillo to enjoy tonight! If you want to join the fun on twitter, the hashtag for tonight is #TempranilloDay. 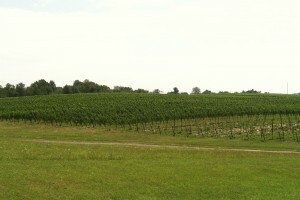 Is There Hope for Maryland Wines? Last week while we were nervously reviewing last minute details for our WSET Advanced Exam, I mentioned to a couple of my classmates that I had spent the weekend in Maryland – dining at Volt restaurant in Frederick and visiting several nearby wineries. It’s true. The trip to Black Ankle was definitely the highlight of our winery stops. I’d tried their wines at an event in DC last year and also read the September 2010 New York Times article about Maryland wines, which mentioned them and others. Since then I’d been curious to check out the Maryland wine experience. Greetings from Vancouver, British Columbia, Canada, judged for the fifth consecutive year by The Economist to be the world’s most livable city. 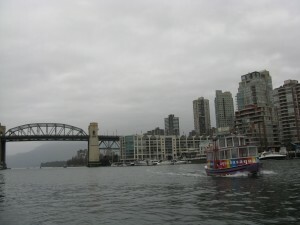 What makes Vancouver so great? Lots of things might, but for the purposes of this blog I’ll argue its vicinity to one of Canada’s two winemaking regions. The up-and-coming Okanagan region is a mere few hours’ drive from the city (just north of Washington State and the Canada/US border), where 190 wineries are producing fair-to-very-good-quality wines from mostly classic varieties. The region lacks a signature regional wine, but BC icewine is recognized as world class, and some Chardonnays have won international attention. In the desert, wine may be a mirage. In fact, after many miles of wandering through the hot, dry, arid climate, many may hallucinate — hoping to get one last sip of their favorite varietal before expiring in the heat. Luckily, the advent of motor vehicles and air conditioning make that prospect a thing of the past. Last week, I managed to snag an invite to a tasting of wines from “Tokaj and Beyond” at the Embassy of Hungary. My conclusion? I don’t drink enough Hungarian wines. First, some background – as most people, myself included, are clueless when it comes to wine from Hungary. The nation has 22 wine regions, the most famous of which, of course, is Tokaj. And they’ve been producing wine there for hundreds of years. The earliest written record of the region’s signature wine, Tokaji Aszu, dates to 1550 – and Aszu wines have been regulated by the government since 1665. 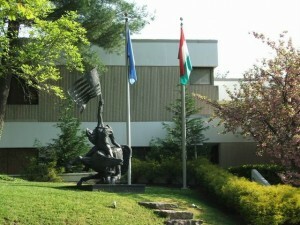 Virginia Dare, courtesy of cdlib.org. When sommeliers, restaurateurs, and wine aficionados discuss the wines of the United States, the focus tends toward California, Oregon, Washington, and sometimes New York. It is not likely to hear any mention of, say, North Carolina in such a conversation. But this was not always the case. In 1904, the top selling wine in the US was produced in the state of North Carolina. Virginia Dare, named for the first child to be born to English settlers, soon had demand far outweighing its supply. 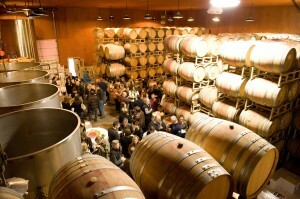 To appease the public’s thirst, California bulk wine was added to increase volume much to the dismay of Americans. The wines of California were seen in the early 1900s as rough peasant fare, thought to taint the delicate complexity of North Carolina’s fine wines. Yet presently, most people — including those in the wine industry — have no idea that states like North Carolina gave rise to wine production in the U.S. and still produce excellent wines. Quick: Name the black grape varietals allowed in Châteauneuf-du-Pape. Grenache, Mourvèdre, and Syrah probably made your list — but what about Conoise?